ORANGE, Calif. (Feb. 24, 2014) – Thompson Boxing Promotions hosted an open to the public workout over the weekend that featured a handful of boxers that will take part in Friday’s loaded”New Blood” fight card from the Doubletree Hotel in Ontario, Calif. In the main event, all-action knockout artist Carlos Carlson (12-0, 9 KOs) and the upset-minded Javier Gallo (21-8-1, 12 KOs) battle for the vacant WBC Latino Bantamweight Title. The bout is scheduled for eight rounds. The co-feature showcases another pair of exciting bantamweights. Once-beaten Issac Zarate (6-1) of Los Angeles takes on Christian Torres (3-4) of Guadalajara, Mex. in a six-round fight. Tickets priced $100, $60 and $40 are on sale now and can be purchased by calling (714) 935-0900or online at www.ThompsonBoxing.com. Special guest and top welterweight contender JOSESITO LOPEZ was in attendance to show his support. After the workout, Lopez and the boxers participated in a meet and greet autograph session for the hundreds of fans in attendance. For additional information please visit ThompsonBoxing.com. For regular updates on our fighters, events, and promotions, please check our Facebook page, follow us on Twitter @ThompsonBoxingand Instagram. To follow the conversation on social media, please use hash tags #ThompsonBoxing, #NewBlood. Doors open at 6:30 p.m. and the first bell rings at 7:45 p.m. The Doubletree Hotel is located at 222 N. Vineyard Dr. Ontario, CA 91764 and can be reached at (909) 937-0900. 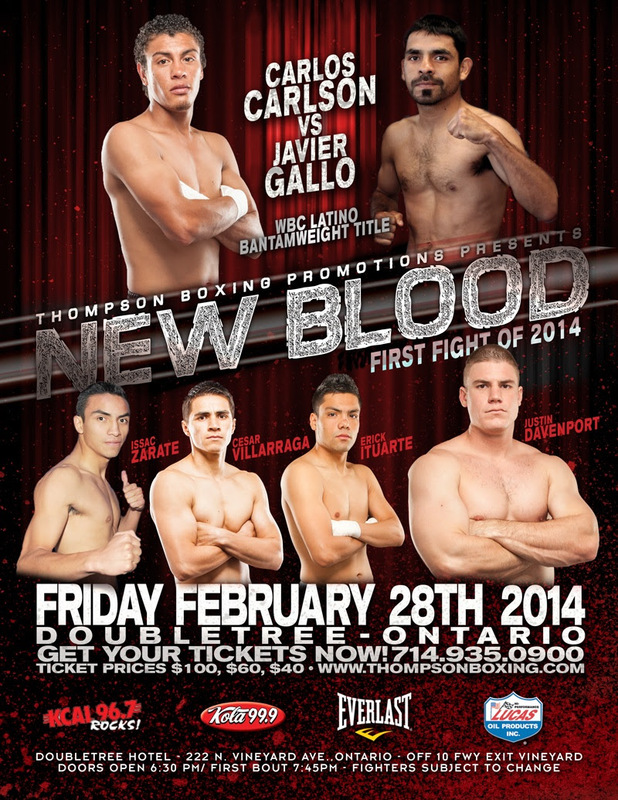 “New Blood” is presented by Thompson Boxing Promotions in association with Antonio Leonard TNT Productions and sponsored by Lucas Oil, in association with KCAL 96.7 Rocks!, KOLA 99.9 and LATV Networks. February 25, 2014 in Boxing News.